The Sanitary 3-way Full Port Ball Valve with Tri-clamp Ends have sanitary tri-clamp end connections. They are ideal for use in food or drink processing and other clean service applications. All of Adamant’s products include an ISO 5211 mounting pad for the direct mounting of actuators. Direct mount eliminates the need for extra space, weight, and cost. A full range of accessory items is available including pneumatic and electric actuators, limit switches, solenoid valves, and manual override devices. 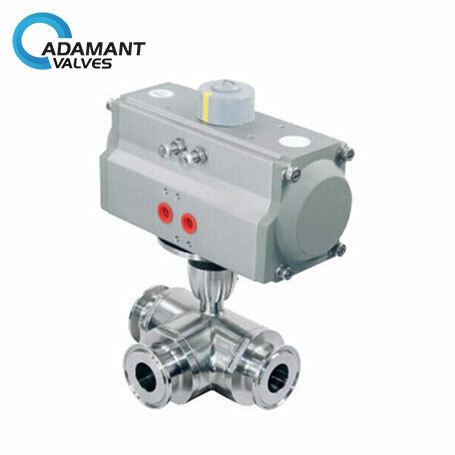 AV-2PFC-3T series is a pneumatic type sanitary 3-way ball valve with tri-clamp / tri-clamp ends, which is extensively used in food & beverage processing, brewing, oil refinery, cosmetic, pharmaceutical, and chemical industries to control medium flow. The full port design with zero restriction makes it an optimum choice for viscous and particulate liquids, AV-2PFC-3T ball valve operates automatically by actuators. AISI 304 or AISI 316L. Tri-clamp / tri-clamp, others available upon request.